Detroit in better days. 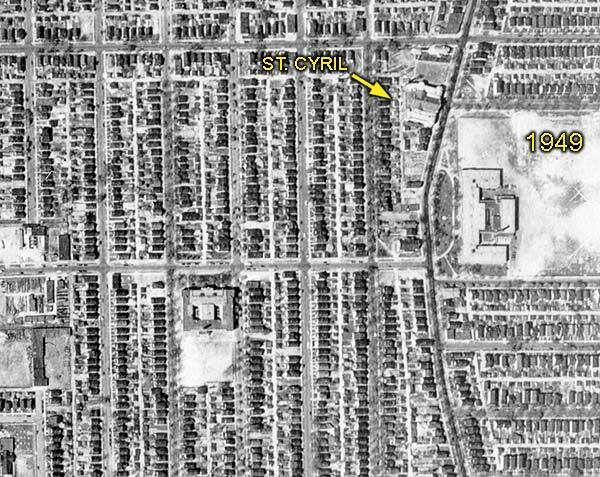 This aerial photo was taken in 1949 over the neighborhood containing St. Cyril Catholic Church. Note the densely populated housing. Following his come-from-behind election to a second term last month, Detroit Mayor Kwame Kilpatrick acknowledged, "Our city is facing some enormous challenges moving forward." One of those challenges, he said, is "making sure that people who grow up in this town have opportunities for jobs in the future." For that to happen, Mayor Kilpatrick and other Detroit officials will be forced to roll up their sleeves and get to work making fundamental changes to Detroit’s economic landscape. For starters, that means refraining from making high-profile projects the centerpiece of reform. 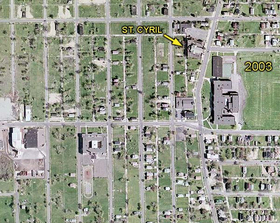 Rural Sprawl: This photograph, taken in 2003 is of the same neighborhood. Few metrics reinforce Detroit’s problems better than this. Since the 1950s the city has lost half of its population. People are voting with their feet and they are not voting for the Motor City. Detroit’s leaders must step away from the failed policies of the past — higher taxes, cumbersome regulation and large, high-profile projects to spur economic growth — and adopt free-market policies that will make the city more inviting to entrepreneurs and, in the process, everyone else. Detroit’s problems are obvious to both the casual and sophisticated observer. Consider the following quote from an October Time magazine article titled, "Decline in Detroit." But blight is creeping like a fungus through many of Detroit’s proud, old neighborhoods. Vast areas have been leveled for redevelopment projects that have not materialized. Down on the waterfront, the city’s $70 million Cobo Convention Hall and Arena is not attracting the anticipated crowds of fast spending conventioneers, [and] this year failed to meet expenses by $285,000. That could have been written in October 2005. What’s striking is that this piece appeared in Time in October 1961. Detroit’s prospects, despite the best efforts of several mayors, have not improved over five decades. Detroit’s problems are largely self-inflicted. Then-mayoral candidate Jerry Cavanagh told Time that he wanted to attract new industries and, "if need be, [impose] an income tax on anyone — including suburbanites — who makes money in Detroit." But this is precisely the wrong mindset. Taxing the very thing you want more of — productive employment, for instance — reduces incentives to work wherever the tax is imposed. Taxpayers are not sheep lining up to be sheared. If they think they’re being fleeced, they will seek friendlier climes elsewhere. It would not be a stretch to say that several Detroit mayors have been the best economic development officers Oakland County ever had. Since that Time story ran in 1961, every assortment of programs and ideas have been hatched — at several levels of government and in the private sector — to improve the Motor City. The word "renaissance" has been used and misused with reference to alleged comebacks too many times to remember. Indeed, the $350 million (in 1970s dollars) "Renaissance" Center (now owned by General Motors Corp.) was supposed to anchor Detroit’s revival three decades ago. According to The Detroit News, on unveiling a plaque dedicated to the building’s private financiers, Henry Ford II said, "Detroit has reached the bottom and is on its way back up." Contributing to the irony, the unveiling was attended by the mayor of Florence, Italy, city of the first Renaissance. In 1996, the Center was sold for just $76 million, a fraction of what it cost to build. It is difficult to overcome the message such a return on investment has on entrepreneurs and other investors. The failure of the Renaissance Center to generate an actual renaissance in the Motor City should have undermined municipal leaders’ faith in the power of big symbols. It did not. In the following decade it was the $200 million People Mover that was touted as the next big thing to revive Detroit. Leaders said the People Mover would make downtown travel easier, thus attracting people to Detroit for shopping and entertainment. They ignored early criticism and concerns. The federal government’s Urban Mass Transportation Administration chief himself called it a "pork barrel project gone wild," according to a 1985 Wall Street Journal article. A local architect and professor described it as "a trapezoid bent out of shape by special interests." The Journal paraphrased one Detroit Association leader as saying, "Skeptics don’t see that the People Mover will spark residential and retail projects downtown." Virtually no observer today would suggest that the People Mover sparked an economic revival in Detroit, yet it continues to absorb millions of dollars in subsidies every year to cover its basic operations. According to the city’s budget department, during fiscal year 2006 the People Mover will require a subsidy of $6.2 million. Despite the People Mover’s shortcomings, public officials and others kept relying on the latest big, flashy projects to revitalize a tired city: Fox Theatre and its rebirth, Comerica Park, Ford Field and Campus Martius come to mind. All of these projects may be "diamonds," but without fundamental changes to Detroit’s economy they will remain diamonds in a very big rough. Consider these examples and the way officials and the media described their alleged impact on the city. Fox Theatre. "Their moving downtown (from the suburbs) was one of the pivotal events in turning things around down here" — Michael Hauser, marketing manager, Michigan Opera Theatre, on renovation of the Fox Theatre and office complex ("Fox Theatre’s rebirth ushered in city’s renewal," The Detroit News, Sept. 18, 2003). Comerica Park. "Still, the mayor contended that Comerica Park was crucial to Detroit’s comeback, if for no other reason than as a morale boost. ‘Comerica Park will help restore the excitement of urban living that has been missing far too long from downtown Detroit,’ Archer said." (Gambling Magazine April 11, 2000). Comerica Park and Ford Field. "Ford described the $505 million, two stadium deal reached at dawn Tuesday as historic. ‘It will mean a rebirth for the Lions and the city,’ he said." — The Detroit News quoting William Clay Ford ("Detroit Comeback," Aug. 21, 1996). Ford Field. "Twenty years from now when people come downtown, they will look back at this day as the turning point in Detroit’s comeback." — Deputy Executive for Wayne County Mike Duggan (Detroit Free Press, April 11, 2000). Compuware Headquarters at Campus Martius. "Campus Martius was Detroit’s town square in John Mullett’s 1830 city plan, and officials hope the development project that borrows its name will be the rebirth of the city’s once bustling central business district." (Detroit Free Press, April 10, 1999). After virtually five decades of decline in Detroit, it is about time for a leader to depart from the long-held traditions of high taxes, crushing regulation, poor services and counterproductive economic central planning. Instead, Detroit should adopt a radical privatization and deregulation program that may lower the cost of doing business — and living — in the city, while simultaneously improving services. The following are several recommendations the Mackinac Center for Public Policy has offered recently. Accelerate reductions in the city income tax. Add no new or higher taxes to the already sky-high tax burden. The city of Detroit maintains an excessive tax burden that weighs on citizens and job providers alike. According to a study prepared by the Washington, D.C., Finance Department, Detroit was the eighth highest-taxed city in the country for a family of four making $50,000 in 2003. Contract city services to competitive private firms with proven track records. The city should conduct a "Yellow Pages" review of the services it provides — that is, it should ask, If you can find it in the Yellow Pages, should city government really be doing it? Whenever private companies can perform a particular activity, the city should either stop producing it or provide it through competitive bidding. Between 1991 and 1998, Indianapolis saved more than $550 million by applying this Yellow Pages test to more than 75 city services. The research literature on privatization shows that with adequate guidelines, private contracting can be effective and avoid cronyism. Dramatically downsize the city bureaucracy, now one of the largest per capita in the Midwest. The use of private contractors should allow the city to decrease its bureaucracy substantially. Through fiscal 2005, the city of Detroit maintained a complement of about 18,600 employees, yielding a resident-per-city-employee ratio of just over 48-to-1. By contrast, Indianapolis maintains a ratio of about 203-to-1. Detroit’s poverty makes this gap inexcusable. Sell assets, such as underused buildings and equipment, and employ these one-time revenues for debt reduction and financing unfunded retiree health care obligations. The city of Detroit is sitting on a mountain of untapped assets. For example, the city could sell its electricity-generating department to the highest bidder. It could also sell its bus fleet and contract the operation to a private firm. It may even be able to sell its water department, which the Mackinac Center for Public Policy estimated in 2001 could fetch more than $1.7 billion. Reduce the regulatory burden on city businesses to a level similar to comparable cities. 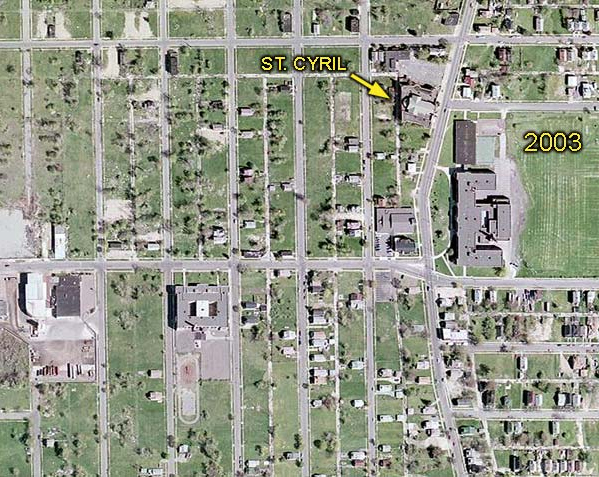 The city of Detroit operates a Byzantine maze of regulations that blanket nearly every facet of private enterprise. For instance, movie theaters in Detroit must submit to an annual city building inspection. This is in addition to a fire inspection, and this regulation is only one of many that add both time and cost to a Detroit theater’s business operation. The city of Indianapolis, by contrast, requires no annual building inspections for theaters and has a generally milder regulatory regime. Not coincidentally, Indianapolis, with a population of only 784,000, is served by 17 theaters with more than 160 screens. Detroit is a city of 900,000 and is served by only two theaters with 16 screens. There is more that Mayor Kilpatrick can do to help the city, of course. He should focus resources on fighting crime, for instance, and he should tell Detroit’s families that their children matter by welcoming philanthropist Bob Thompson’s proposed investment of $200 million in charter schools for Detroit. 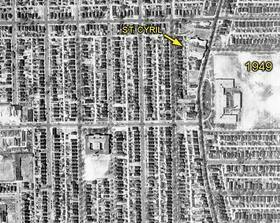 But the five steps outlined above would help reverse the "Decline in Detroit" that Time magazine described in 1961. That article offers an instructive lesson. If Detroit residents had read that article and then been told that 44 years later things would be much worse, would they have supported more of the same? We trust they would have demanded a much different course. That said, what will Detroiters in 2049 think of their leaders’ decisions today? Can they read the writing on the wall any better than those of 1961? One thing is for certain: Detroiters must commit to improving their city. If not, and Detroit’s decline persists, the state may be forced to appoint an "emergency financial manager" to run the city under Public Act 72 — an unfortunate end for the mayor and Detroit itself. Michael D. LaFaive is director of fiscal policy for the Mackinac Center for Public Policy, a research and educational institute headquartered in Midland, Mich. Portions of this essay were adopted from his Viewpoint commentary, "An Agenda for the Next Mayor of Detroit." Permission to reprint in whole or in part is hereby granted, provided that the author and the Center are properly cited.